The endangered lesser long-nosed bat (Leptonycteris curasoae) is one of a few bat species that undergoes long distance migrations. To survive these migrations, the bats must time their travel to coincide with the flowering or fruiting activity of their food plants. The floral resources they depend upon have been threatened by wildland habitat conversion and fragmentation. Rural residents have also mistaken these large-bodied bats for vampire bats and their caves have been targeted for destruction. In order to implement effective conservation strategies, it is crucial that we understand bat habitat requirements and migratory corridor locations. We identified bat nectar corridors based on dietary requirements, genetic analysis, and migration energetics analysis. The North American subspecies of lesser long-nosed bat (L. c. yerbabuenae ) appears to be divided into three groups: spring-birth coastal bats, spring-birth montane bats, and winter-birth bats. While movement appears to be restricted between reproductive demes in females, but not males, no significant genetic population subdivision was detected. Northward migrating L. c. yerbabuenae follow two corridors (Coastal Lowland Route and Inland Montane Route) in the spring migration, which may take as long as three and a half months. One corridor appears to be utilized (Inland Agave Corridor) in the southward fall migration, however it has not been confirmed that spring-birth coastal migrating bats all use this route. Pollinator mutualism between these bats and their food plants appears to vary latitudinally. Adequate habitat should be maintained in both northern migratory corridors and winter-birth migratory locations to conserve these bats and their role as pollinators and potential seed dispersers in arid ecosystems. Relatively few species of bats undergo long distance migrations (Fleming and Eby 2001). Since most species of north-temperate bats migrate relatively short distances (� 1000 km) between summer and winter roosts, few of these species ever leave the temperate zone. Instead of migrating to the tropics, nearly all of them evade harsh winter conditions by hibernating. In North America, only five bats (two insectivores and three nectarivores) migrate substantial distances (up to 1,800 km) from temperate-zone summer roosts into the neotropics for the winter. Of these species, the three nectarivores barely reach the United States after migrating north from central Mexico. Leptonycteris curasoae and Choeronycteris mexicana form maternity roosts in northern Sonora and southern Arizona in the spring, whereas L. nivalis sometimes occupies post-maternity roosts in southwestern New Mexico and Big Bend National Park, Texas, in the summer (Fleming et al. 2001). Unlike migrant insectivores or carnivores, whose food supplies tend to be relatively uniformly distributed across habitats, but are cryptic (to evade predators), migrant nectarivores (and frugivores) depend on a food supply (nectar, pollen, and fruit) that "wants to be found." These migrants cannot search widely among habitats and necessarily expect to find food. Instead, their foraging activities and migratory movements are much more tightly associated with habitats and locations occupied by their food plants. Moreover, owing to the seasonal nature of most flower and fruit supplies, they must time their migrations to coincide with the flowering or fruiting of their food plants. Therefore, these migrant nectarivores travel along "latitudinally broad paths of blooming plants" called nectar corridors (Fleming et al. 1993). 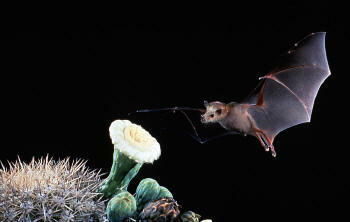 Lesser long-nosed bats are specialized for visiting flowers and feeding on nectar and pollen. They have elongated rostrums, long, brush-tipped tongues, reduced tooth number and size, and the ability to subsist on a diet of nectar and pollen (Howell 1974, Freeman 1995, Simmons and Wetterer 2002). They also consume the fruit of columnar cacti. These bats live in colonies containing thousands of individuals (unlike other members of the subfamily Glossophaginae) in "hot" caves and mines (Arends et al. 1995, Fleming and Nassar 2002). Advantages of roosting in hot, humid caves with thousands of conspecifics, as well as with large numbers of other bats, include minimal energy expenditure and evaporative water loss during the day and excellent thermal conditions for maximizing rates of embryonic development during pregnancy and for the growth of the pups after they are born. Two subspecies of lesser long-nosed bats have been identified: L. c. yerbabuenae and L. c. curasoae. The latter, L. c. curasoae, lives in northern South America and nearby Caribbean islands and exhibits a reproductive pattern of winter mating and spring birth (Smith and Genoways 1974, Petit 1997, Martino et al. 1998, Fleming and Nassar 2002). Leptonycteris curasoae yerbabuenae resides in North America, and exhibits at least two reproductive patterns (Ceballos et al. 1997, Fleming and Nassar 2002). Bats of this subspecies that migrate north to maternity roosts from southern Mexico follow the spring-birth pattern of L. c. curasoae. Other bats of this subspecies (those that migrate to maternity roosts in central and southern Mexico) give birth in the winter after presumably mating in the summer. While movement between populations is not likely to be restricted in this highly mobile subspecies, these temporally segregated reproductive patterns may act as a barrier to effective dispersal, resulting in two reproductive demes (winter birth deme and summer birth deme). Female lesser long-nosed bats undergo a single pregnancy each year (Ceballos et al. 1997, Fleming and Nassar 2002). In the group of northward migrating bats, mating takes place between October and December in south-central Mexico. After migrating north and a gestation period of about 6 months, females give birth to a single pup in northern maternity roosts (hot caves), most of which are located in the Sonoran Desert. After the young are weaned, maternity roosts disband and adults and young bats migrate south in late summer and early fall. Fall and winter roosts are located in south-central Mexico, and spring and summer roosts occur from northern Sinaloa to southern Arizona. Not all individuals of this species undergo an annual migration (Rojas-Mart�nez et al. 1999). In western Mexico, females are much more likely to migrate than males, most males appear to remain south of Sonora year round (Cockrum 1991, Ceballos et al. 1997) although some migrate as far north as southeastern Arizona in late spring. The timing of the northward migration, the distances that individual females travel, and the routes they take are complex and vary from year to year. The dates at which females arrive at their maternity roosts vary latitudinally. This variation probably reflects geographic variation in the availability of cactus flowers, which bloom along the Pacific Coast of Mexico in a south-to-north progression (Valiente-Banuet et al. 1996). The late summer departure of bats from their maternity roosts is correlated with declining resource levels and perhaps weather/climate conditions. Lesser long-nosed bats are federally listed as an endangered species in both the U.S. and Mexico. Their migrations from south-central Mexico to the Sonoran Desert and other parts of southern Arizona are considered "endangered phenomena" (See Brower and Malcolm 1991). Critical resources that need to be protected include safe roost sites and habitats containing adequate densities of food plants. Safe roost sites include caves (and mines) that provide protection from predators and human disturbance and that have acceptable microclimates. Fortunately, the mating cave in Jalisco and several of the major maternity roosts in the Sonoran Desert occur on federally protected lands in Mexico and the United States. However, little is known about the locations and vulnerability of transient roosts used by lesser long-nosed bats during migration. Some of these roosts likely are located in the states of Nayarit and Sinaloa in western Mexico, in areas that are difficult to explore because of their remoteness and drug activities. Ironically, the existence of narcotraficantes (drug traffickers) in these areas probably benefits the bats by keeping people away from their roosts. In many areas of Mexico and elsewhere in Latin America, cave or mine-dwelling bats are often at risk as a result of misguided vampire bat eradication programs (Villa-R. 1967, Tuttle 1994, Winter and Coen 1997). 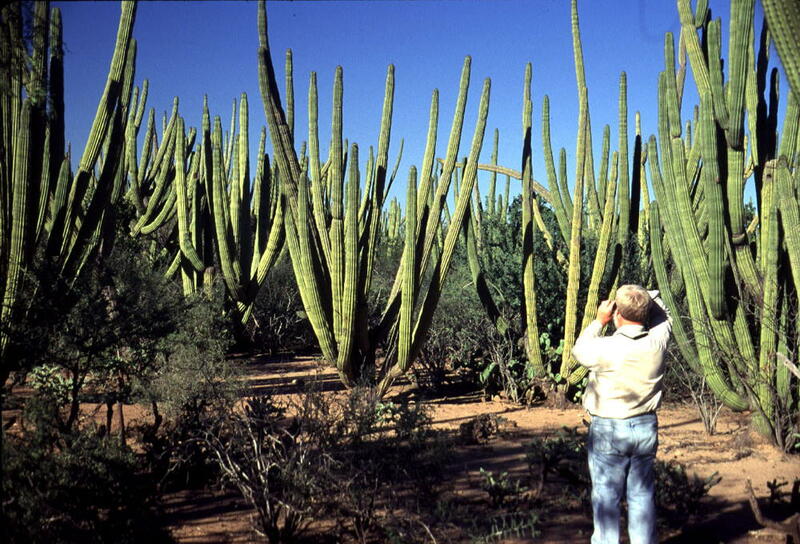 Adequate densities and distributions of food plants, especially columnar cacti and paniculate agaves, along migration routes must be maintained. Dense stands of organ pipe cactus in Coastal Thornscrub are important feeding areas for nectar-feeding bats on their northward migration. This one is near Las Bocas, Sonora. The principal threats to these resources are wildland conversion to agriculture, ranches, and recreational and urban developments. Another important threat is the growing rate at which wild agave is harvested for tequila production - the agave are harvested before they have an opportunity to bloom. Fragmentation of wildlands along the Mexican coast from Jalisco to Sonora will continue to increase and endanger flower-dependent bats as they migrate. It is important that we better understand lesser long-nosed bat migrations in order to effectively focus conservation efforts. Our goal was to predict the migratory corridors of lesser long-nosed bats by direct observation (locating cave/mine sites and observing bats flying/feeding at night), and by using carbon stable isotope analysis to examine dietary requirements, mitochondrial DNA (mtDNA) analysis, and migration energetics analysis.